Will an HP T5700 TC still work? Posted: Thu Aug 17, 2017 12:08 pm Post subject: Will an HP T5700 TC still work? I have a 512/512 T5700, Win XPe SP2 w/IE 6. Q. Will MJ work in the above environment? Q. Will the fact that IE 6 is involved cause any hiccups? I gave it a go and it does work as far as making and receiving calls goes. I can not however get the 'Contacts' or 'Recent' lists to d/l. 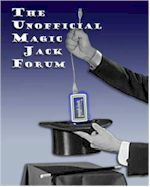 I've tried listing *.magicjack.com and *.talk4free.com in the 'Trusted Sites' zone of IE 6. I've also lowered the security as much as I could see fit under IE's Tools > 'Advanced' tab. I've forwarded ports 5060~5070 to the TC. I commited all of the above but still no Contacts. Is there any other tips or things that I could try to get the Contacts to d/l? Well I've resigned to the fact that this unit will not d/l my contacts and/or recent calls. I've packed up the ole' T5700 and with a small portion of all the money that MJ has saved me over the years, bought an Intel Compute Stick. I plugged in my MJ dongle, ran the update.exe from MJ and it works great. I also have my contacts and recent calls.